When he was around 14, Walter Wicks and his brothers found 40 pounds of butter in the mud at Cassiar Flats. “Our family was well supplied with butter for it turned out to be perfect,” he later wrote in Pioneer Legacy, a compilation of early settlement stories compiled by Terrace resident Norma V. Bennett. Near the case of butter was a white board bearing the name Mount Royal. 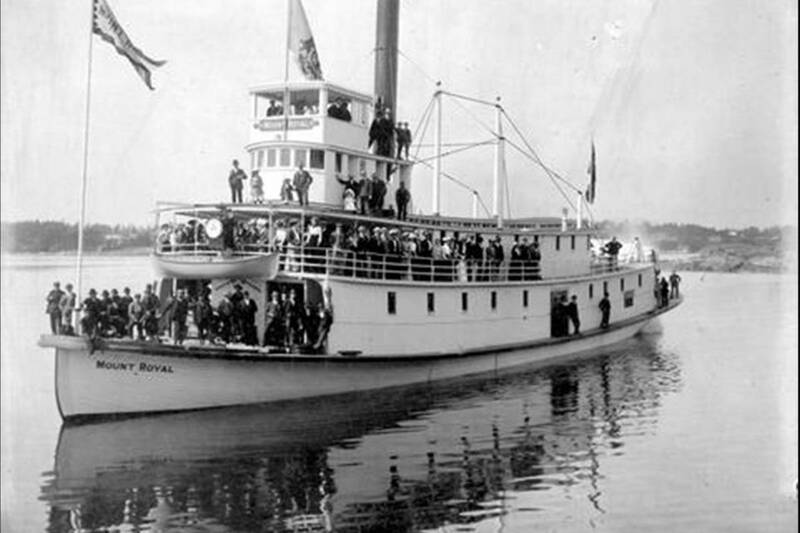 The Wicks brothers guessed that this meant the riverboat Mount Royal, the most luxurious steamer on the Skeena River, had wrecked. The Mount Royal was launched by the Hudson’s Bay Company in Victoria in 1902, and named after Baron Strathcona and Mount Royal, then the chairman of the company. Despite trouble launching (which some would later say was a bad omen), the Mount Royal was soon sailing along the Skeena under the command of the well-respected Captain Stewart B. Johnson. With 25 staterooms, hot and cold water, lounges with plush furnishings, and an outdoor promenade, the Mount Royal was seen as the height of steamer luxury. During her travels on the Skeena River and its tributaries, the Mount Royal ferried many different passengers. Her passenger lists challenge many of our modern ideas about riverboat travel, which may include the assumption that most passengers and crews were Europeans. In reality, passengers on the Mount Royal included Europeans of various origins (such as Irish, Swedish, English, and Scottish), First Nations individuals, and Chinese and Japanese people. Those travelling by riverboat might be settlers, resource workers, crew members or high-ranking officials, such as Hudson’s Bay Company inspectors and, in 1904, President Charles Hays of the Grand Trunk Pacific Railway. The Mount Royal was wrecked in Kitselas Canyon July 6, 1907. Image C-03885 courtesy of the Royal BC Museum and Archives. These influential men made decisions that shaped the future of the Skeena region, while the contributions of their less-powerful fellow travellers are often ignored. It was with this typically diverse array of passengers and crew that the Mount Royal set out on the Skeena River from Hazelton the morning of July 6, 1907. The season had just begun and the river was unusually high — the Mount Royal and other riverboats had close calls on their few previous voyages. As the Mount Royal made her way through Kitselas Canyon, the most treacherous part of the voyage, a strong wind blew her off course and into Ringbolt Island. Captain Johnson ordered all passengers to evacuate immediately, although some women were reluctant to leave the comforts of the ship, because of the deceptively gentle impact, and had to be escorted off by crew members. With the passengers huddled on the island’s shore, the crew tried desperately to bring the ship alongside the island, but as the boat’s stern swung around and the Mount Royal was trapped perpendicular to the river, it became apparent that she could not be saved. As the Mount Royal’s starboard side was pummelled with both wind and water, Captain Johnson ordered all crew ashore and jumped down just as his boat split apart. According to witnesses, he remained calm until he heard that 11 crew members were still onboard the ship, after which he had to be restrained from jumping into the river to follow them. Of the 11 crewmen still trapped on the Mount Royal as she split into over a thousand pieces and hurtled downriver, six were lost and five, whose survival Captain Johnson later called “miraculous,” lived. Some of these lucky survivors arrived at the village of Endudoon or New Town, populated by the Gitselasu people. As Kitselas Canyon’s indigenous inhabitants, the Gitselasu living at New Town were skilled at navigating the rapids and canoed upriver to help the passengers still stranded on Ringbolt Island. European settlers from the nearby town of Kitselas also hurried to help after seeing shards of the wrecked ship float by, and offered shelter and supplies to the wreck’s survivors. Many locals also helped with recovery efforts. Captain Johnson was primarily concerned with finding the bodies of the six men who died. Despite his efforts and the efforts of the First Nations, who were commended for “giving all the aid they could,” only one corpse was found. Some mail, papers and books were also recovered, but the majority of the cargo and the passengers’ belongings were lost. Charles and Slim both also relate the rumour that the Mount Royal’s safe was full of gold collected by prospectors during the long winter. Nobody ever found the gold, leading to suspicions that it was never really in the safe. For those that witnessed it or its aftermath, the wreck of the Mount Royal was an unforgettable event. Families like Walter Wicks’s salvaged unexpected treasures from the riverbank, and children living near Kitselas Canyon would explore what remained of the hull, which had been washed onto a beach near the bottom of the Canyon. The ship’s window is now at Heritage Park, along with artifacts from other riverboats. The park recently received a door which may have belonged to the Mount Royal as well, although it has not been definitively identified. The accident also prompted the Hudson’s Bay Company to install additional bolts on Ringbolt Island as a safety measure. The wreck of the Mount Royal was not the only riverboat accident to occur, but was the only one that resulted in loss of life — something remarkable considering the dangers present along the Skeena. Although tragic, the story serves as an example of how people from diverse backgrounds worked to help each other at a time when the relative isolation of the area made it necessary. Madeleine Link is Heritage Park’s Collections Researcher for the summer and a third-year Bachelor of Arts Student at the University of British Columbia. This article originally appeared in the 12 July 2017 edition of the Terrace Standard.